If content production is not a regular part of your business process, I'm telling you now, it should be. Whether you do it yourself or outsource it, content creation in all its forms is a business activity. All successful business have this in common. Tracking your video content is just as important. You invest time and money into creating content so you want to make the most out of it. That's a no-brainer. A good business investment is one where the ROI (return on investment) is good. Tracking your content will have a great contribution to content production ROI from a very early stage of your business. It's not a business activity you should put off until your business gets big enough. If you put in place a system at the beginning, it can grow with you as your business and your content portfolio grows. Unless you're not interested in making your business profitable. In which case you should stop reading this blog right now. This is where I tell you all about the benefits of tracking your live video content. There is no point in pursuing topics your audience are not interested in. Looking at your video stats will tell you what topic is doing well and what isn't. You might think that talking about the finer points of knitting winter jumpers for polar bears is just tops. If your audience isn't' taking to the subject, you will know it from your stats. You will also see at what point audiences are leaving your videos. It's a good indication of when they lose interest in what you're saying. Making a list of the videos that got the most engagement is a good idea because you can rehash those topics and expand on them in your future content. When you have your video content on several platforms, it's even more sensible to track your stats. Knowing what platform works better for you is a strength for your business. It will indicate which one you need to spend more time and effort on. It's helpful in deciding whether or not to move onto a higher plan on a platform or even if it's worth hiring someone to manage that platform for you. Speaking of monetisation, knowing what platform gets you the most engagement should be a big deciding factor as well. The more diversified your income, the better. When you first start creating videos, you will not think that it's worth investing time and possibly money in a great system that will track that content for you. If you use Facebook live streaming, the video library will give you some useful stats and other features will help you sort your content into playlists and tags. What happens when you want to take your video content outside the realms of Facebook? It's a sensible step to make for a growing business. Even if you think that it's another hundred years away before you will need to do it. 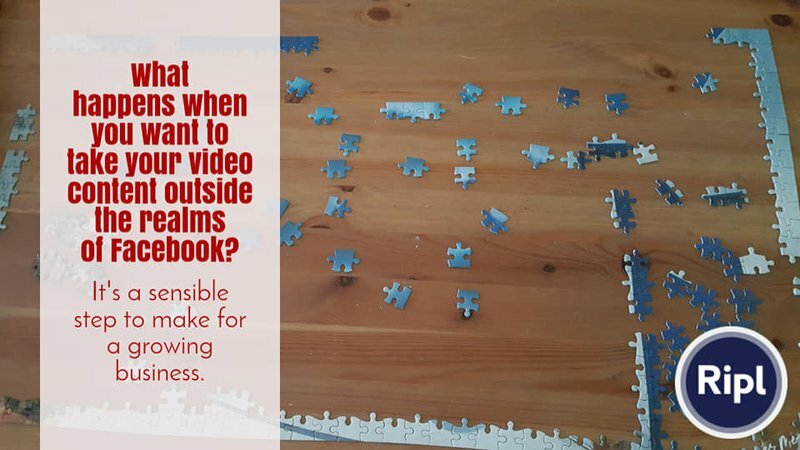 Before you know it, you will have a few dozen videos in your Facebook Video Library. That's a good thing! If you haven't been doing it, it's a good time to start sharing those videos in Facebook groups, resharing them on your page, embed them in your website, add them to your blogs and all those delicious things you can do with them to increase their reach. So how do you know where you have posted those videos and when? Unless you have tracked them somewhere, you will have no clue. You won't have the time to go searching in groups every time you wonder if you have uploaded your video in this one or that one. Knowing where you have shared your content and when will save you time and a mighty big headache. Connecting to my previous point, when you track your video content, you will be able to see your gaps. Opportunities you haven't explored or exploited with your content yet. Chances are that even if you have picked a handful of Facebook groups to be very active in 6 months ago, things would have changed and you want to try new ones. At least this is a practice you should try. Just as a sidenote. Facebook groups have their own rules according to their community managers, so sharing links isn't always allowed. This is where being able to download your Facebook live stream video and posting up to the group instead of its link is a great idea. Knowing exactly what videos of yours are in what group can give you a great planning advantage. Especially when you can hashtag days. You can plan months and months ahead with your existing content. Imagine not having to record video content every single time you want to launch your quarterly program. You can just go to your content tracking system, download the right video and upload to the group in question in the correct sequence. That would make your launch process a breeze! It really is a no-brainer! Crosslinking is one of those little things you can do to keep your audience watching, reading, listening to your content for longer. Surprisingly people still often forget to do it. This is where you create a link from one content element to another to help your audience hop onto your next piece of content. Hyperlinks embedded in blogs, in video descriptions, images that are clickable that take your audience to somewhere else on your website. And it does amazing things for your SEO. Google will think your content is the duck's guts when it detects internal links that go somewhere else in your content. To make the most of crosslinking, you need to pick the parts of your content that naturally relate to another piece. If you have a video on the benefits of Baltic ice dipping for naturists, you want to connect that video to something else that would be a sensible topic to consume right after that video. When you track your content with some keywords on what's contained in a video, it's easier to find related topics. You can rely on your memory but if you have dozens or even hundreds of videos, unless you're a champion chess player with amazing recollection abilities, this will not go down well. You wrote that blog 6 months ago from that live video that you did last summer. You know it would be a fantastic one to share because a topic that's closely related has come up again. If only you remembered when exactly you did that video and on what platform. Now you have to write a new one or do a new video because you can't find the original. You just CBF because you're so busy in your business that you don't know Arthur from Martha. So you just don't do the blog, don't do the video. Having a great tracking system will eliminate that for you, right off the bat! It's OK to share old blogs. It's fine to share old video. If they are still relevant, then why not? Anything to make your business processes easier. No? Imagine being able to just go into your content management and tracking system and easily find that post, that URL, that video. And just grabbing the details and share them. Easy peasy. What a difference that would make. Of course, if you'd rather spend time sifting through years of content for the slim chance to find something you created years ago, do that. This blog was probably not for you. If you want to get your content tracking in order, it's never too late though. Whether you're just starting out or are a seasoned content creator and astute business chick, I can help you get started with your tracking. Have a look at this simple video content tracking sheet below. It's there for you to download and use as you please! Do you think it could be improved? Have I missed something on it? Let me know in the comments.